Sun., July 29, 2018, 2:52 p.m. 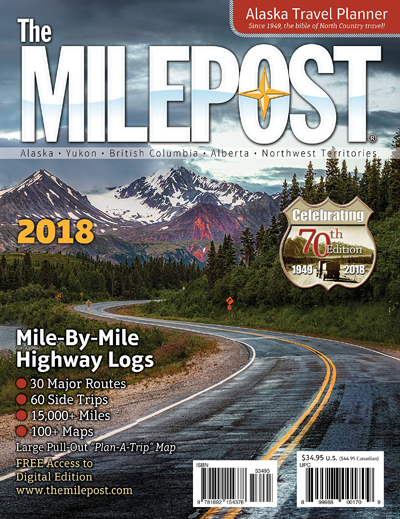 If you're going on a road trip to Alaska, start with The Milepost. That's what readers Les and Anna Mae Hogan say. "We have driven to Alaska multiple times along all the different routes we could find," Les Hogan writes. "To take the trip with or without an RV having a current Alaska Milelpost is essential. It helps with campgrounds, sights to see, miles between services, absolutely everything you need to know, mile by mile." Anna Mae Hogan particularly likes the campgrounds and the scenery. "Our trips were done either in May or September," she writes. "In May you follow the spring north and in September you follow autumn south. Gorgeous!" Anyone else have some tips for this epic trip? We're heading out in mid-August. Send them to goingmobile@spokesman.com. And please share your photos. Thanks! Posted July 29, 2018, 2:52 p.m.